Hey, it's been a while, hasn't it? I've just finished my first nursing placement which was a little intense, but I'm back and I'm better (shout out Bryson Tiller). I want to share with you my new venture that I started a couple of weeks ago. 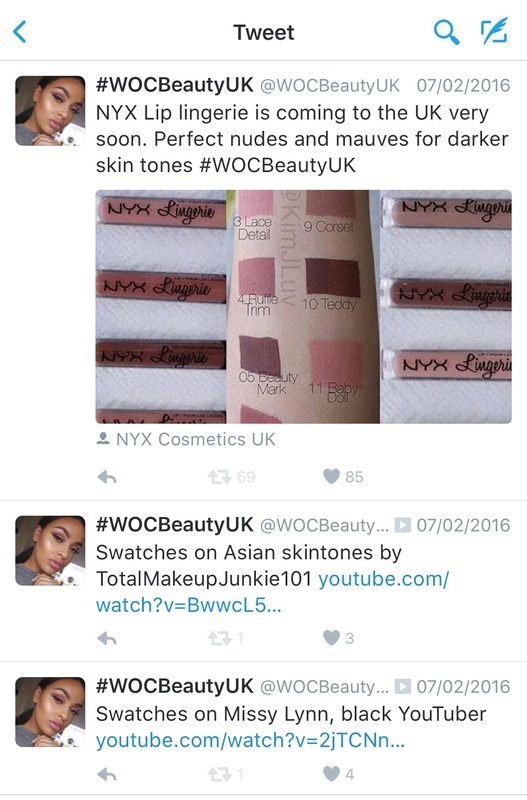 I decided to create a beauty page on Twitter (which I’ll hopefully expand) for women of colour in the UK to pick up tips, new product launches, bomb beauty looks and to find new YouTubers and bloggers to watch and read. There are similar pages, but they mostly cater to US girls and they always get the stuff before we do *cries* and there are different brands available. I knew it would be beneficial to me if I could see swatches, tips, beauty looks and beauty bloggers all in one place that had a similar skin tone to me and to know that I can buy these products to recreate the looks. If you have a darker complexion, then I’m sure you know the struggle of trying to find foundation in your shade and the only 2 “dark” shades are too light and too dark for you. With this page I hope to direct women (and men) of colour to affordable and high-end makeup so we can get foundation that match us, lipsticks that suit us and beauty looks that slay us! My page is not limited to women of colour, men who wear makeup and those of lighter complexions can and have picked up tips from my page. You can find me on Twitter and Instagram come say hi! 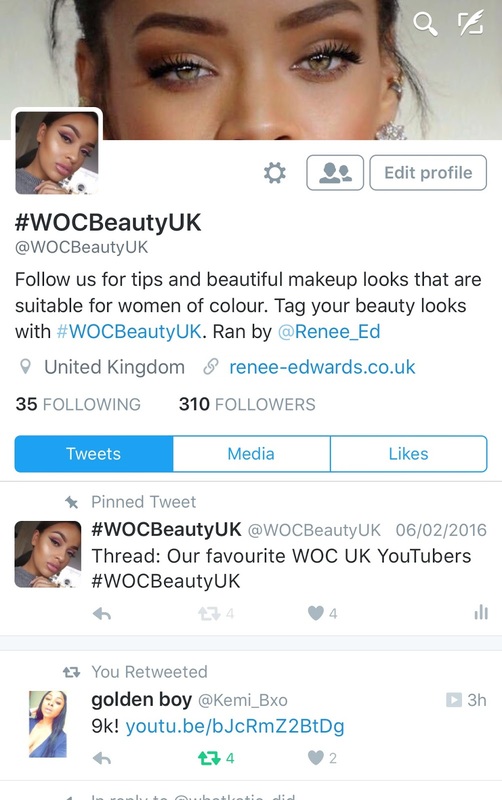 And you can find Women of Colour Beauty UK on Twitter and please use our hashtag #WOCBeautyUK to share your beauty looks and beauty posts. I’d love to know your thoughts and any requests so don’t hesitate to tweet me. Thank you for reading and I'd love to hear your comments about my new venture.